We, at Brown Design Company are promotional product distributors and proud members of the Advertising Specialty Institute. Promotional products, also known as ad specialties, make up a nearly $22 billion dollar industry and are used by virtually every business in America. Why? Items like mugs, pens and t-shirts are memorable and provide a better cost per impression for advertisers than almost every major marketing effort like TV, magazines and the Internet. We are able to supply your company with every possible promotional product from over 3000 suppliers. With so many ad specialties available there is a huge opportunity for professionals like you to boost ROI and leave a lasting impression with your customers. Our mission is to help you create long-lasting relationships with your clients through the power of promotional products. Custom Promotional Products imprinted with your Name or Logo promote your company brand. 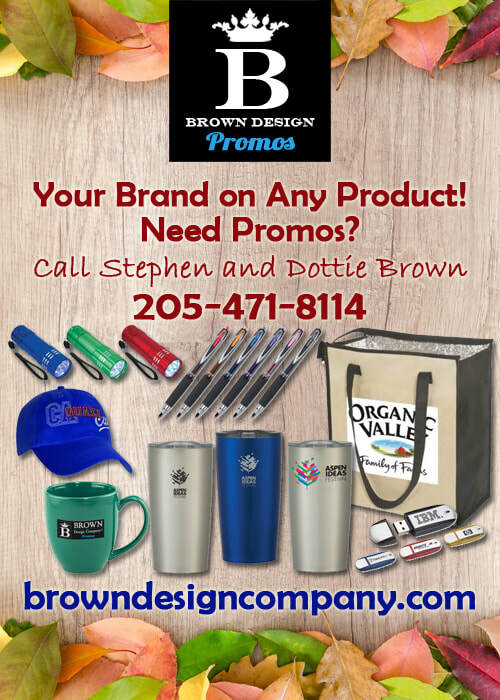 At Brown Design Company, we have access to hundreds of thousands of promotional products and the expertise to select just the right products for your promotions. Each promotion that we do is much more than just products with your logo imprinted on it. It is about reaching your objective, brand recognition and growing your business. Quality products and quality imprinting are important to us and to you. Trust Brown Design Company to take care of all of the details from the beginning to completion of your promotion. CALL Stephen Brown or Dottie Brown today at 205-471-8114 to start building your promotion! At Brown Design Company, LLC, we are all about personalized service and custom products. Your Business Name or Logo on any product! Let us help you with your next Trade Show! From lanyards, badge holders, table runners, magnets, pens and giveaways, we'll help you get ready.